I grew up in Columbus, Ohio, with the Reds and Indians each being approximately 120 miles driving time from my home. In a stroke of genius, I will now use YouTube to sum up the two franchises' fortunes since 1980 in two single at-bats. This is going to be great! Searching YouTube. They have everything on here. Here... we... go! Um, hold on, let me try Marlins win. Um, no. OK, Eric the Red Bombs. Oh, it's Fernandez with a "z" not with an "s." WTF? No clips?? Ugh. 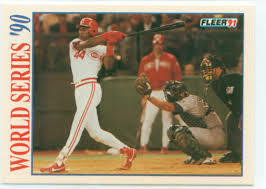 I had planned on showing a concise clip of Eric Davis's Riverfront-rattling bomb off Dave Stewart and the favored A's in Game One of the 1990 World Series and the Tribe's Tony Fernandez heartbreaking 10th-inning error, costing Cleveland the 1997 title to the upstart Marlins as my two defining moments. Seriously nerds, do it. Remember, it's up to you.